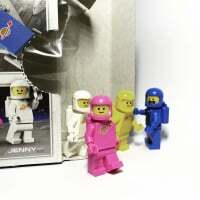 Ok, many of you are avid collectors of collectable minifigures. As you are all well aware, each one comes with a black, 3x4 flat stand. Anyone who has collected any amount of these will have about a million (or, more accurately, as many as they have CMF's...) of these hanging around. Apart from using them as ... minifig stands (come on, how boring is that? ), has anyone else found any brilliant uses for them? I saw someone use them as tracks for a clone trooper tank. If I find the link again I'll try and post it. It was a huge thing, and remote controlled if I remember correctly. My daughter used them as a staircase for her mansion - but it's since been dismantled. @pepper yeah that's the one! Craziness! (But think I got the remote controlled thing confused with another turbo tank I think). This was exactly what I was thinking about. I thought of staircases, but I never had anywhere to build one... :P Would you stack them one or two at a time for staircases, then? @plasmodium - she stacked them one at a time. Really looked neat - sort of like an onyx staircase from an old fashioned movie. I've done the same. It depends how much space you have (just like in a real house!). I went two plates for each tread, since one per tread gives you a very shallow staircase so you need a long horizontal space if you need it to go up high. 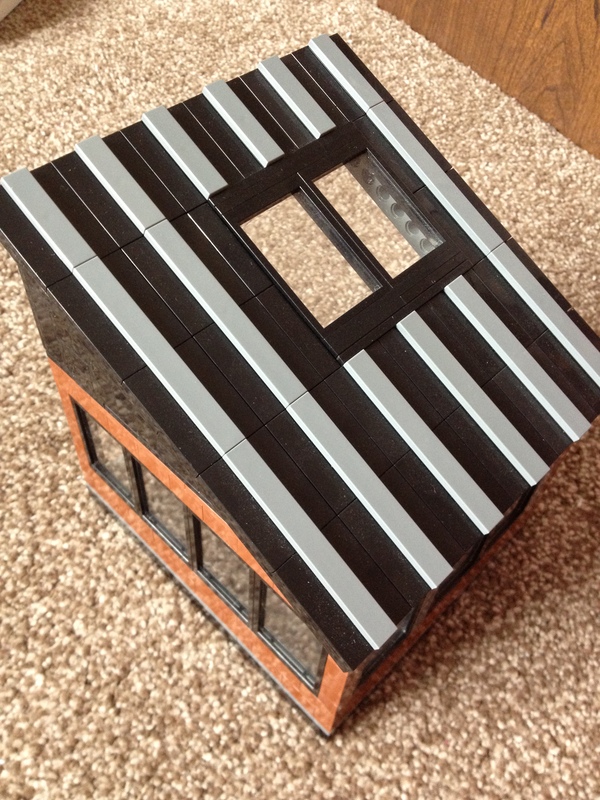 I saw a great use for these stands at BrickFair 2011, as roof tiles: http://imgur.com/ZjXsX. I wish I could tell you the name of the builder. @malleable That IS a very good idea for them! ^^ The roof is a good idea. I'm glad I bought just over 100 of these at 3p each a couple of months back. I knew they would be good for something! I was trying to think of a use for these as well, and randomly, my son just walked in the room and showed me his beach-themed "Oasis of the Future" where he used the CMF stands as solar panels. Very creative and perfectly timed. I used them on the spokes of a water mill, as paddles. Cleaning off and using as above? Let me guess. The next two suggestions are gonna be 'Olympic tank treads' and 'Olympic solar panels'. I built a roof out of them... didn't take pictures, unfortunately. Still needed some work. Or you can flog em to me!! I'll buy stands from ya for 10p ish if you have a bunch spare! Ta! This is the beginning of my Modular homewares store. @caperberry That MOC says NPU all over. I love the tile floor, and the way you did the front door. The LIFE logo is awesome too. Make sure to post some more pics when you're done. Posted it unfinished as I won't be able to work on it again for a couple of months. Pretty happy with this ground floor, although the photos were really rushed and it's more cluttered than I anticipated. The problem is that I have a large number of plates but I need to find a way to use at least some of them. I tried a few different key words on this site to do a search plus a few google searchs but the only thing I got in the search results was either about something else, was about the homemade minifigure stands, or the lego grab bag topic(omg, talk about ripping open old wounds). @Joseph - how do you do it? Are you just great at searching, or do you have some amazing memory of threads. On topic. I got rid of my stands recently to a couple of bricksetters. Useless to me, and nice to give something back. ^ :-) I suppose lot of it is remembering if/what was in the previous discussion, but after you have a rough idea, a quick Google search (as the forum search feature is terrible) will almost always pull up what you're looking for. In this particular instance though, I just pulled it from the directory of useful forum threads. Jackpot! thanks. I tried the term "Minifigure stands" but that didn't work out. I give them out at Halloween in lieu of candy. "Hey kids, you're getting Lego!" ^ I wonder what makes the dentist richer- the cavities from all the candy, or the broken teeth from chewing on Lego minifig stands? That's what technic pins and part number #30187e are for. I just saw one other wonderful use for the stands. Check this out! The stands are on top, covering the long "nose" of the ship. Like someone said in the comments of that picture, they do add "texture" to it. A bit hard to see, but I used them as a texture detail in the area above the front shell. The rest of the studs in that area are covered with tile. I have used the stands to make a chimney for my daughter's modified Olivia's House build we are working on. I just stacked enough of them to make the middle of the chimney stack. I have Engraved 100 of them for use as wedding favours for an AFOL couple. They make great lids for 4x3 crates.